After the Civil War ended, President Andrew Johnson, who took over after President Lincoln was assassinated, made high ranking Confederate soldiers, as well as various Confederate government officials sign an amnesty pledge of loyalty. By signing this pledge of loyalty, these former Confederates hoped to regain rights such as citizenship, voting rights, and the right to hold office. One government official who needed to petition was Robert Laban Abernathy, whose status as the tax collector in the 54th district in Burke County, North Carolina made it necessary to petition for amnesty. He signed the petition and provided President Johnson a letter begging for reinstatement and explaining his story behind assisting the Confederacy. By analyzing supporting primary and secondary sources, Abernathy should have his citizenship and associated privileges reinstated due to his consistent loyalty to the Union, his reluctance to assist the Confederacy and take the position of tax collector for the sole purpose of supporting his large family. Abernathyâ€™s letter to President Johnson begins by Abernathy focusing on his support of the Union before North Carolinaâ€™s secession. Abernathy references his pro-Union and anti-Secessionist attitude by saying he has â€œkept in regular correspondence with W. G. Brownlow, your Provisional Governor of Tennessee, and other distinguished Union men, as to the best manner.â€ (Abernathy, Amnesty Petition) While I cannot confirm Abernathyâ€™s relationship to Brownlow, in terms of what their relationship was or how long it lasted, I can confirm that Brownlow was a Unionist during the war and a member of the Whig party before the war. In 1862, Brownlow was editor and publisher for the Knoxville Whig, which he said â€œwill be an unconditional Union Journal, holding up all participants in the late Rebellionâ€¦as a choice collection of men for a Roguesâ€™ Gallery!â€ (Brownlow, Prospectus of the Knoxville Whig, 1862) Brownlowâ€™s strong ties to the Union makes him an ideal character reference, and assuming Abernathy and Brownlow had a similar purpose and close relationship, their correspondence should convince President Johnson that Abernathy was a consistent supporter of the Union. Abernathy expresses not only his pre-secession and post secession loyalty to the Union, but also his reluctance in holding a government office job under the Confederacy. There does not seem to be evidence supporting Abernathyâ€™s claim regarding how â€œthe office of District Tax-Collector of 54th Dist, of N. Carolina was tendered to him by the Chief Collector of N. Carolina, which tender your petitioner thrice refused to accept, but which was returned to him the third time with the full assurance that it would pay your petitioner well for his services.â€ (Abernathy, Amnesty Petition) Correspondence between the Chief Collector and Abernathy is not available, but Abernathyâ€™s situation as a tax collector petitioning for amnesty was not uncommon. Another tax collector, C.W. Clarke, also from Burke County, also petitioned for amnesty. In his petition, he claimed that he â€œhad no connection with the Confederate army and has not given aid nor comfort to said army except such as was prompted by motives of humanity or to which he was compelled by Confederate Laws.â€ (C.W. Clarke, Amnesty Petition, 1865) Another tax collector, R.C. Burgin of neighboring McDowell County, also argued that he took the role of tax collector to avoid enlistment in the army and not â€œfor the purpose of aiding the said rebellion.â€ (R.C. Burgin, Amnesty Petition, 1865) Reluctance or performing the bare essentials of the job of tax collector was common and Abernathy expressed genuine opposition to assisting the Confederacy more that was deemed necessary. Robert Laban Abernathy was not a high ranking official in the Confederacy and held a small role within Burke County, North Carolina. He provided a summarization of his Union connections which could be corroborated by support from W.G. Brownlow. Abernathy represented the beliefs of many tax collectors in western North Carolina by showing reluctance to keep the position of tax collector, which he only accepted so he could provide for his family. Group 94, Publication M1003, National Archives, Washington, D.C. The petition of R.L. Abernathy, of the Co. of Burke, and State of N. Carolina, respectfully showeth to you Excellency, that prior and up to the time of the passage of the Ordinance of Secession by the Convention of the State of North Carolina in May 1861, your petitioner was a devoted friend of the Union of the States, and used all his efforts in public and private to preserve the Union of the States; and that even after the Ordinance of Secession was passed, your petitioner kept in regular correspondence with W. G. Brownlow, your Provisional Governor of Tennessee, and other distinguished Union men, as to the best manner of proceeding in reference to this matter, until all mail arrangements between the North and the South were broken up. Your petitioner further showeth to your Excellency that after the Ordinance of Secession had passed, the office of District Tax-Collector of 54th Dist, of N. Carolina was tendered to him by the Chief Collector of N. Carolina, which tender your petitioner thrice refused to accept, but which was returned to him the third time with the full assurance that it would pay your petitioner well for his services. Your petitioner being a poor man and having a large family to support, finally accepted the appointment upon these grounds. These are the only reasons that prompted your petitioner to take any post whatever in favor of the so called Confederate States against the United States. Abernathy, R.L. Amnesty Petition, July 13, 1865. Case Files of Applications from Former Confederates for Presidential Pardons (“Amnesty Papers”), 1865-67; Records of the Adjutant General’s Office, 1780s-1917, Record Group 94; Publication M1003, National Archives, Washington, D.C.
Brownlow, William Gannaway. “Prospectus of the Knoxville Whig.” (Philadelphia: Published by W.G. Brownlow, 1862), in American Broadsides and Ephemera, Series 1, no. 11160. (accessed on March 19, 2014). Burgin, R.C. Amnesty Petition, October 2, 1865. Case Files of Applications from Former Confederates for Presidential Pardons (“Amnesty Papers”), 1865-67; Records of the Adjutant General’s Office, 1780s-1917, Record Group 94; Publication M1003, National Archives, Washington, D.C.
Clarke, C.W. Amnesty Petition, July 27, 1865. Case Files of Applications from Former Confederates for Presidential Pardons (“Amnesty Papers”), 1865-67; Records of the Adjutant General’s Office, 1780s-1917, Record Group 94; Publication M1003, National Archives, Washington, D.C.
U.S. Census 1860. “Free Inhabitants of Burke County.” Morganton Post Office, 1860, in “U.S. Federal Census 1860,” http://www.fold3.com/image/52318729/ (accessed on March 22, 2014). 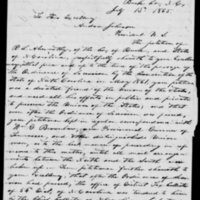 Abernathy, R. L., Amnesty Petition of R. L. Abernathy, July 13, 1865, Civil War Era NC, accessed April 24, 2019, https://cwnc.omeka.chass.ncsu.edu/items/show/857.